In a scathing attack, veteran Supreme Court advocate Ram Jethmalani has shot a new letter saying he is totally disappointed with Prime Minister Narendra Modi's three years of performance, and each day more and more evidence is piling up "of your failure as a friend and as the leader of the unfortunate lndian nation that trusted its destiny in your undeserving hands." 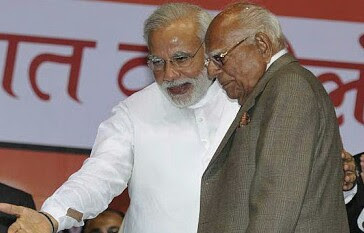 Telling Modi that "your conduct or rather gross misconduct no longer compels my silence", Jethmalani says that Modi "won the election mainly and almost certainly on the promise to the people of bringing back 90 lakh crores of black money which is equivalent of 1500 billion US dollars", adding, "You promised putting 15 lakhs Indian rupees in the account of every poor family." Jethmalani, who wrote the letter to Modi on August 23, says, "You won my confidence and support by proclaiming that agenda of recovery of the stashed away ill-gotten wealth in foreign banks was your major mission in your election campaign." Pointing that he as the Prime Minister was of "no help" in his effort to unearth black money after willing polls, Jethmalani says, "The awful truth dawned on me when in early 2015 BJP president Amit Shah openly disclosed that all talk about black money recovery was a ‘chunavi jumla', a gimmick or joke." Calling it "a confession of a huge fraud never repudiated or explained by you", Jethmalani regrets, "I must confess I am ashamed of my stupidity but I am determined to see you suffer a shameful defeat in 2019, long before your selected date, 2022." Accusing Modi of following Congress' footsteps after coming to power, Jethmalani recalls, "The United Nations had worked for four years and produced in 2004 the Convention Against Corruption mainly dealing with black money stolen from many countries." Pointing towards how the then Congress government in power "signed the Convention but deliberately did not lodge with the United Nations the document of ratification without which the Convention does not become binding", Jethmalani accuses Modi of making "no exposure of this fraud to the Indian nation." He further recalls, "The German government, by paying a bribe of US dollars 475 million to an employee of the Liechtenstein bank, obtained 1,400 names of concealed accounts in early 2008. The Swiss Bankers' Association and the German government announced that this list had a majority of Indian criminals." "Germany publicly offered to share this information with the Indian government too without cost or condition. Yet the government in power did not avail of the offer", forcing him to approach the Supreme Court, yet even today, he or other co-petitioners have received "no assistance of any kind from you or anybody else in the country." Accusing Congress president Sonia Gandhi of inviting the Swiss Finance Minister and entering in "a secret protocol", Jethmalani says, "two suicidal terms" of the protocol were (1) India will seek no information about the past but only the future, and (2) India will not use the United Nations Convention of 2004 but only the Double Taxation Avoidance Treaty (DTAT). Pointing out that all this was made known through media, Jethmalani says, it is at this point that Modi approached him for a joint effort. The letter reads, "l have repeatedly explained to you that this fraud requires to be exposed. DTAT is not an international document but a document under Section 90 of the Indian Income Tax Act. It does not apply to criminals who have laundered black money but only to honest tax payers who have to pay income tax on the same income in more than one country." Jethmalani asks, "Tell me Mr Prime Minister why even after you have become Prime Minister you have not requested the German government to do for us what they have done for much richer countries? ", accusing Modi of becoming "a silent accomplice in cheating the nation." Underlines Jethmalani, "In a written reply to a question in Rajya Sabha as to what the Finance Minister was doing to recover the black money in foreign banks, he answered that he was entering into amended DTAT with many countries. He fully went along with the Congress' decision and has betrayed India." Telling Modi that he was made Rajya Sabha member only to "please" him, Jethmalani says, the real reason was, "You wanted my professional services for Amit Shah in a serious murder case", even as talking on about his "great ambition of recovering India's stolen wealth." Dear Mr. Jethmalani - You are a wise old person and I have a lot of respect for you. You choose to see Mr Modi with your eyes closed. Yes the progress about some aspects of black money is not adequate. As a wise and successful advocate you must see the total picture and performance of the NDA government. And see it in the light of history of UPA. Then perhaps you will see the benefits of NDA.... but only if you want to. The tone of your article is personal and derogatory and childish. It reminds me of "why I did not get a new pencil" kind of a complaint from a school boy. Please elevate your criticism to a constructive and useful level. If you want to defeat Modi - do you want to bring the Gandhi's back - or Mamta perhaps. I hope you are not bringing back Lalu Sir?!?!? !